In 1945, as countries from around the world were shaping what would become the United Nations, former U.S. President Jimmy Carter was on a battleship in the Atlantic Ocean intently listening to those milestone debates on a radio. “I was very interested in what was happening and was very thankful as a Naval officer that there would be no more wars in my lifetime,” recalled Carter, speaking on “Human Rights in Today’s World” before a packed audience in Glenn Memorial Auditorium last week for Emory University School of Law’s Centennial David J. Bederman Lecture. Since then, the U.S. has been at war with more than 30 countries. “And we are now in something of a war with six or seven countries,” Carter noted. But those early deliberations were critical, the “one time in the history of human beings when the leaders of the world decided pretty well unanimously to look into the depths of the great religions — Christianity, Judaism, Islam, Buddhism, Hinduism and so forth — and extract the finest aspects of all of those moral and ethical standards and values and put them into effect,” explained Carter, a global humanitarian and Nobel Peace Prize recipient, who serves as an Emory University Distinguished Professor. By 1948, former first lady Eleanor Roosevelt was pushing to create a Universal Declaration of Human Rights, with the goal of establishing a humane standard of treatment for all citizens of the world — the genesis of a global human rights ideal that has been heavily challenged in recent years, he said. In effect, the U.S. has abandoned its basic commitment as a global human rights champion, Carter said, noting that the country's resolve in championing international law has weakened, too. It’s a trend that has intensified under the current presidential administration, Carter said. He acknowledged that he “flinched a little bit” when President Donald Trump announced during his inauguration ceremony earlier this year that the American way of life would no longer be forced on other people — which Carter interpreted to mean human rights. Though he doesn’t see political winds shifting any time soon, the former president noted that he finds strength in the work of human rights advocates around the globe who continue to shine a light on abuses through their reports to The Carter Center, an Emory affiliate dedicated to waging peace, fighting disease and building hope. “I’m still hopeful because of the heroism I see,” he said. Today’s human rights outlook marks an unsettling shift for the 92-year-old statesman, who announced in his own presidential inaugural address in 1977 that human rights would constitute the foundation of his foreign policy. 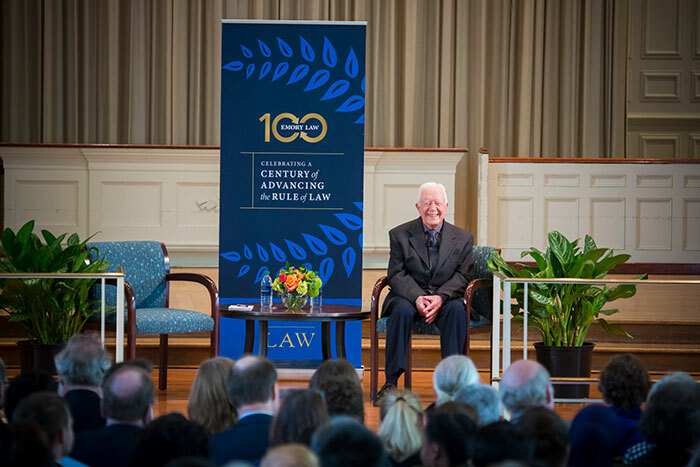 As the 39th president of the United States, Carter is credited with introducing human rights “into the center of our conversations about policy in the United States and around the world” — a commitment that would not waver after he left office, said Emory Law School Dean Robert Schapiro. 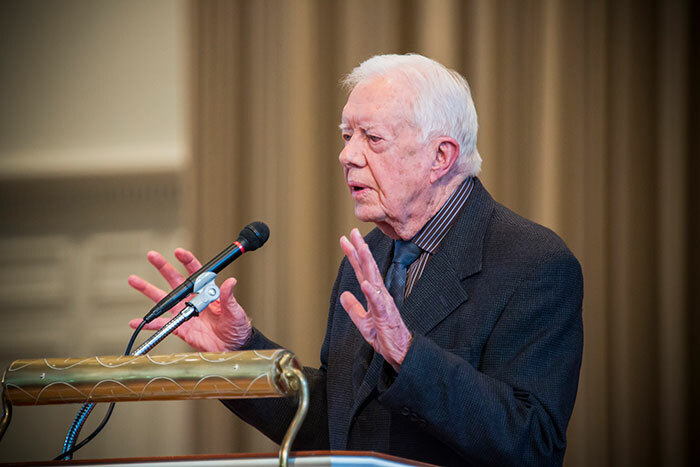 “In his decades of work with Habitat for Humanity and the Carter Presidential Center, he has continued to promote human rights and he has worked tirelessly to alleviate suffering across the globe, advance democracy, support economic and social development and find peaceful solutions to international conflicts,” Schapiro said during introductions before Carter's April 6 speech. The annual lecture honors former Emory Law Professor David J. Bederman, the K.H. Gyr Professor in Private International Law, who served on the faculty of Emory Law for 20 years and was a skilled legal advocate, arguing cases before both the U.S. Court of Appeals and the U.S. Supreme Court. 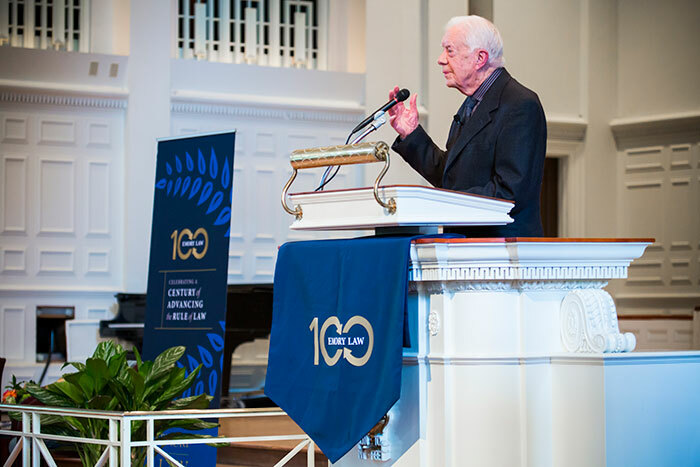 In his remarks, Carter examined the evolution of human and civil rights during his lifetime — from the influence of African Americans in shaping his rural Georgia childhood to witnessing the integration of the U.S. armed forces and eventual civil and voting rights advances under the Rev. Martin Luther King Jr. and President Lyndon B. Johnson. Carter said that he sensed a turning point following the terrorist attacks of Sept. 11, 2001, when the U.S. departed from its support of the Geneva Conventions when engaged in the war on terror, as well as individual privacy rights in the communication of its citizens. By lowering human right standards, the U.S. “sent permission to human rights abusers in other counties to lower their standards as well,” he said. He also challenged his audience to take a broad look at what constitutes human rights today, including the abuse of women around the world, human trafficking and campus sexual assault. Carter urged everyone to read the Universal Declaration of Human Rights. Then, within each person’s sphere of influence, “take two or three of those commitments that you know are being violated and do what you personally can to end the violation,” be it writing op-ed pieces or social activism. Should we explore a new way to enforce human rights? “The concept we’ve had for 45 years was that the U.S. would be the champion of human rights and that we would use our influence in the United Nations and other forums to set an example,” he said. Does any crime merit the death penalty? “I don’t think it should ever be an appropriate penalty in America. I would like to see the death penalty abolished,” he said, insisting that it has not been effective in deterring violent crime. Given human migration trends, what should be the media’s role in creating empathy and a sense of unity? There are now more people displaced in the world than ever before, Carter said. The U.N. has identified 65 million people as being displaced from their homes — about 21 million of them are refugees, he said. How will the current administration influence social movements, including Black Lives Matter and the women’s movement?